Jaw Presetting Fixture Order Number 1009-07090 for use with 6", 8", 10", 12", 15", 18" and 20" sizes Standard Bore and King Bore Models Quick Change Jaw Power Chucks. 3-Point Adjusting Feature in the chuck body permits indicating in to zero. Increase Soft Jaw Life by using adjustment feature. Reduce or eliminate re-boring of Soft Jaws. 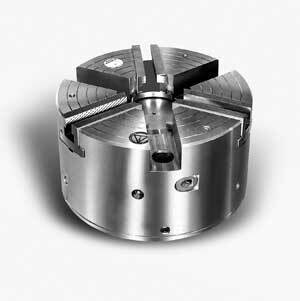 Close center design with chip ejecting discharge chutes in the chuck body face reducing build-up to near zero. High RPM ... up to 5,000 using standard top jaws ... without loss of gripping force, due to internally counter-balanced design. Quick Change Master Jaws, 2 sets supplied with each chuck permits offline pre-assembly of top tooling for next job reducing traditional setup time by 95%. SAFE Visual Indicator shows when Master Jaws are in the unlocked mode. Utilize existing top tooling by selecting style of master jaws from 1.5 x 60, 1/16 x 90, Am. Std. Acme, Am. Std Tongue & Groove and Square Serrations or substitute mono block jaws. Sets can be mixed styles. Doubles as collet chuck as master jaws have keyed radius in front that accept standard W & S collet pads. Eliminate time wasted on switching over to collet chuck. Utilize the machine's existing actuating cylinder - including Japanese types. Easy Installation - removable blank sleeve in the chuck allows the customer to bore and thread the sleeve of the chuck to match existing drawtube of drawbar. PBA can supply chuck sleeve prethreaded on request, at a nominal charge. Optional Jaw Setting Fixture (as shown) for presetting top jaws off the machine for the next job, while the machine is still running. A real timesaver! Sizes 6", 8", 10", 12", 15", 18", 20", and 24" diameters. Use 26 for Acme Serration. Use 27 for Square Serration. 1. Dimensions listed are with 1.5 x 60° Japanese type master jaws. Some dimensions will vary using other Master Jaw types such as Acme, 1/16" x 90° or Am. Std. Tongue & Groove. 2. Chuck is at mid stroke with master jaws flush with the body O.D. 3. UNC mounting bolts available upon request. Mono block jaws are extremely accurate solid one piece design ideal for dedicated jobs, and will allow you to work closer to the chuck face, due to no jaw bolt obstructions. For longer service Mono Block Jaws are made from a nitride hardening material to allow hardening after forming without major distortion. See our product catalog for dimensions. 10" 12" 15" 18" 20" 24"